Fred Buhler officiated on behalf of the EMC. PELLY, Sask.—Sept. 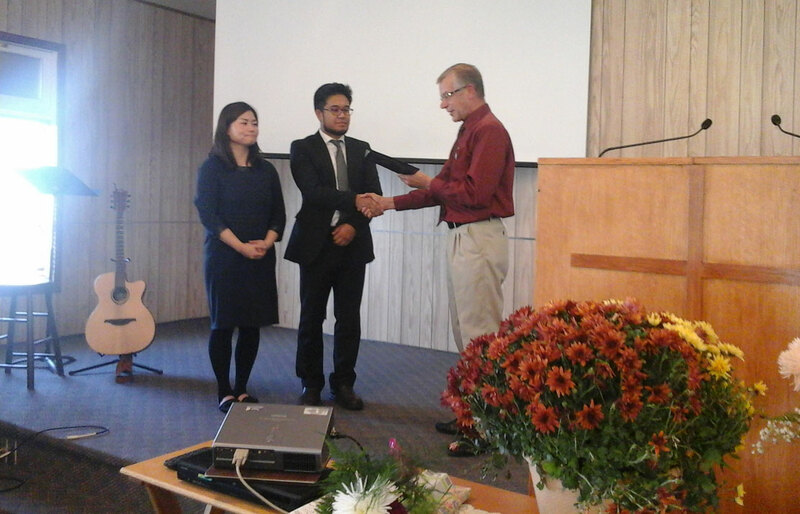 25, 2016, was a special day for members and adherents of Pelly Fellowship Chapel, as this was ordination day for pastor Hyoungjin (Frankie) Kim, supported by his wife Minju. The day dawned bright and sunny, the ladies had a lunch prepared, 3 p.m. was the time. The chapel was comfortably filled. There were representatives from three of the EMC churches in Region 3—Hudson Bay, Birch River, and Swan River. People came also from the Kamsack Evangelical Free, the Hyas Baptist, and the Norquay Covenant churches. Many Pelly folk came. Very pleasing for the Kim family was that Pastor Kim’s father from South Korea was able to be present. Merv Abrahamson was chair for the evening. Lewis Anfinson read from 2 Tim. Simon Yoon and his wife Joy, who made the trip from Calgary to be with their friends, the Kim family, provided special music. On behalf of the wider EMC, Fred Buhler, pastor at Hudson Bay (Pineridge) and a member of the EMC’s General Board, had a short message of encouragement for Frankie, Minju, and the congregation. He then conducted the ordination service. It was a solemn, meaningful, and joyful time. Many people went forward to give their support during the prayer of dedication. Suitable gifts were presented to Frankie, Minju, and their daughter Choah by Merv Abrahamson, chairman of the board; Donna Abrahamson, ladies president; and Brenda Bellows, Sunday School superintendent. Simon and Frankie sang two numbers with Joy at the piano and Frankie’s father, the senior Mr. Kim, on the harmonica. The chair then announced an “open mike” time. Many people took this opportunity to speak words of encouragement and appreciation for the Kim family. The day ended with lunch and fellowship in the lower hall.